Our Junior Boys Volleyball team poses with their NorWOSSA Gold Medals. 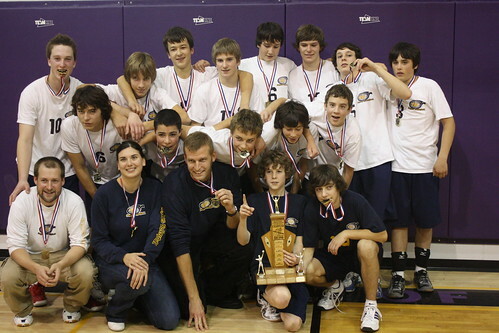 The Eagles Junior Boys Volleyball are the 2009 NorWOSSA Champions. The boys first eliminated the Beaver Brae Broncos 3 to 1 (25-19, 25-12, 12-25, 25-13). The boys then went on to eliminate the Fort Frances Muskies in 4 sets to capture the championship. The Junior Girls Basketball team advanced to the final round of playoffs after defeating the Broncos 43 to 35, but fell to Fort Frances 35-24 in the championship game. The Senior Girls Basketball season ended with a 30-28 loss against the Kenora Broncos. The Senior Boys Volleyball team defeated Fort Frances in 4 sets (25-22, 25-12, 19-25, 25-16) to advance to the finals, where they fell to the Broncos in 3 sets. Congratulations to all teams for their great seasons!